Level designers (by level order): Jelly Jam, PT32, Archon, Primpy, happygreenfrog, Slaz, Loon, PurpleJazz. Smoke provided the custom enemies script. Episode artwork by TurkoJAR, color reduced by Seren. Special thanks to all music composers, tileset makers and sprite rippers. Music can be found here. Better late than never, huh? Follow up to Holiday Hare 17. Devan is trying to take over Carrotus by plunging into a new ice age using his weather control machine to create ferocious snowstorms. Will you be able to stop him?! If you missed the music download link, Music can be found here. Updated HH18_level01.j2l, HH18_level01.j2as Now you start with infinite lives in the first level, also saves gems properly now from level to level. 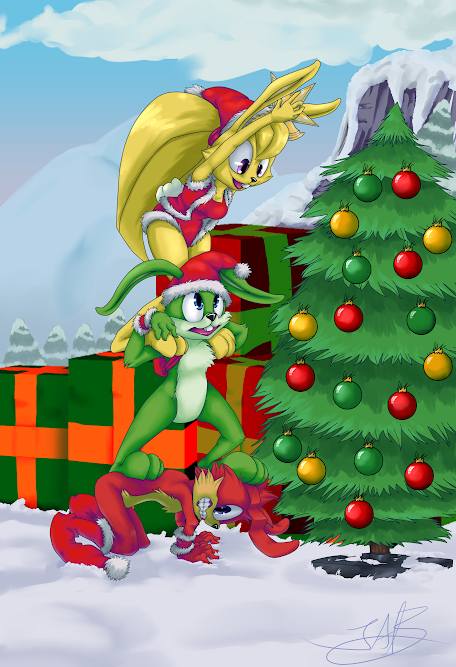 So, there it is, Holiday Hare ’18. After three months of work and around a month of delay, it’s finally here. The level consists of 7 levels, each being made by a different level maker. Despite my implication in this level pack, I promise that this review isn’t biased and I’ll give my thoughts on each level with the exception of my level, as well as general ideas about the episode. The gameplay is mostly well made. The difficulty scaling is done properly and there barely any sections that make you want to say “Bah, that’s bulls**t!”. What I consider to be worth mentioning is that the level pack is very easy. I suggest picking Hard difficulty instead of Medium for a more challenging experience and if you want to play it casually, Medium is the best pick. As for Easy, unless you’re very inexperienced with video games (or with JJ2), don’t even consider it. Visually, the level pack is mostly pleasant to the eye, with no noticeable tile bugs. The music is well chosen, a bad loop or two here and there but nothing too irritating. As much as I’m trying to give this level a lower rating, I can’t bring myself to do so. It’s a perfect introduction to what the level pack has to offer, teaching the player all the mechanics and shenanigans they’ll have to deal with throughout the episode. The visuals are gorgeous… until the later part of the level. Jelly’s idea to add the “Club Penguin” section was very nice but the tileset chosen for it was not really the best. The music chosen is also very fitting. “Tipplenborough” takes an interesting approach to designing a JJ2 level. Unlike most of the levels, it’s very open and lets the player choose whatever path they want to. This, however, makes exploring for gems and coins a little bit tedious. Due to its massive size, secrets are a bit of a hassle to find and backtracking to explore another path can be a bit tedious, if not impossible (it’s no longer possible to backtrack at some points in the level, such as the ending part). Most of the secrets are very well hidden, to the point that you can replay the level a bunch of times and still be unsure where to find some of them. If you want to get the proper bonus for this level, you’ll have to explore a lot to find enough coins for it since they are, again, well hidden. The level is still interesting regardless of its flaws. The visuals are nice but there are some tile bugs scattered around the level. The music chosen for this level is very fitting. There isn’t much to say about this level, though that doesn’t mean it’s bad. The level design is nice, although a bit too narrow at times. Well done eyecandy, the music is nice as well. Again, it’s a very nice level but just not as memorable as the others. HGF’s idea of a level is also very interesting, as “Breaking Out” revolves around collecting a certain amount of coins in order to proceed. This level is the shortest but it certainly is not a bad level. The level design is mostly well done, the visuals are pleasant to the eye and the music is fitting. The boss at the end of the level is the cherry on top, shoutouts to Smoke for making such an interesting boss battle for this level. The boss is a bit too easy on Easy and Medium but a challenge worth considering in Hard and Turbo. “Toyed Badlands” is a perfect blend of open spaces and narrow paths. Not linear in the slightest but at the same time not confusing to explore and getting lost in it is out of the question. The only problem I had with this level is the eyecandy. Don’t get me wrong, the tileset is well chosen, there are no buggy tiles, it has nice animations and all that jazz (pun intended). It’s just that I don’t like how the colors the level uses blend together. This might be very subjective but I don’t think the blue-pink-red of the sprite layer works with the green-mint green of the background. The music is… okay. Neither too fitting, nor completely unrelated to the level’s theme. I consider this level to be the gem of the pack. The gameplay is challenging, as expected for the final regular level of the pack. Just like Slaz’s level, it’s neither too narrow nor too open. The level revolves around spikeballs, which serve for both aesthetics and level design. The enemies are well placed, the pacing is good and the theme of an underground base is conveyed perfectly. The eyecandy is a perfect blend of Carrotus and a shady, metal based bunker. The music chosen fits the level like a glove. Stunning in every single aspect. The perfect way to end such a wintry JJ2 episode. Very well done and nicely scripted final bosses, as well as great visuals and well chosen music. This level consists in two bosses, both of which are fair and challenging (especially in Hard and Turbo). The way of presenting the story of this final level is very nice, properly combining humor with seriousness. Very naisu! TL;DR: Great wintry level pack with nice visuals, gameplay and music. Pick “Hard” instead of “Medium” if you’re looking for a slightly more challenging experience. It’s a must-play for every JJ2 player! I’ve only properly played through the first three so far, but I am very impressed, especially by level 2 which I thought really captured the spirit of the original HH98 levels and built upon it, using the 20 years of JCS history that followed.